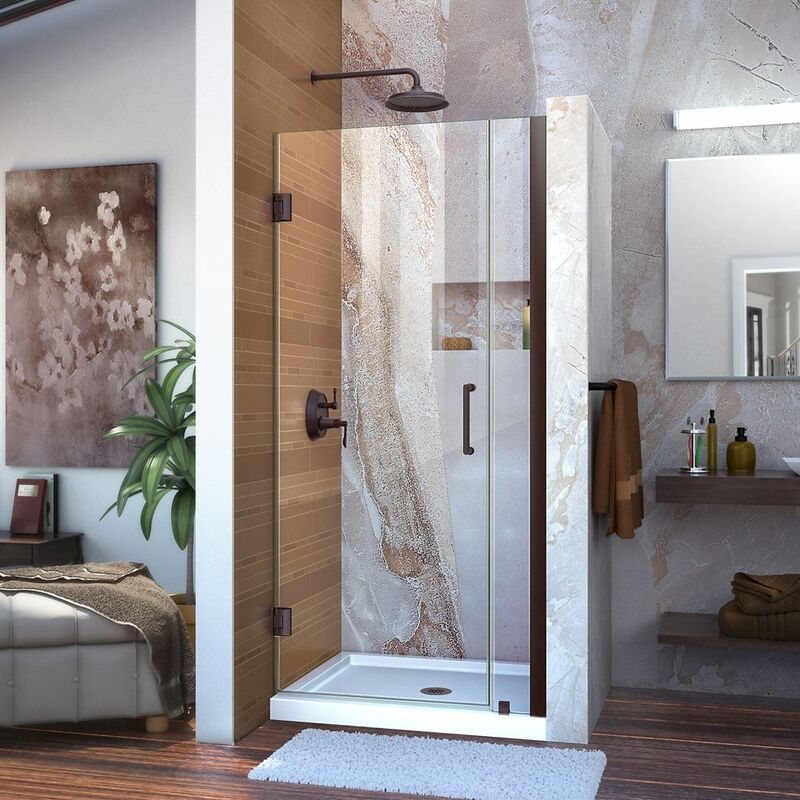 Unidoor 35-inch x 72-inch Semi-Frameless Pivot Shower Door in Oil Rubbed Bronze with Handle is rated 4.4 out of 5 by 7. Rated 4 out of 5 by z311 from Nice product Door is heavy and a bit awkward. Takes two people to install with good mechanical skills or a professional. Takes a couple hours to install but diagrams all steps very well. The glass for the door itself seems to have a little curve so doesn't strike perfectly flush on closure strip but within a 1/8". Overall door looks great and operates well. Would recommend. Rated 4 out of 5 by Bassguy from Nice looking door,but expensive. Door was shipped in four packages but only one package was delivered to me by store personnel to take home. Had to return to store to pick up other three packages after realizing that I did not have complete product for installation. Instructions for installation not very clear but understandable after you figure out which specific door you are installing. Finished product looks very nice after installation, however one door hinge makes popping noise when closing door. Rated 4 out of 5 by JoeNavy from Nice looking shower door! The door and the associated hardware seemed well made and it is a very nice looking door. I installed this by myself and we have used it twice so far with no leaks. The door is HEAVY and was a bit hard to move around by myself. I also had to open up the backside of the wall it was being installed on to add extra support as I did not know ahead of time that it requires installation into a stud or 2x6 support. The only poorly made thing was the wall anchors for the holder of the stationary glass. They were too small for the recommended hole I drilled and slipped into the wall when I tried to put the screw in. I'm a pretty handy guy and gave it a "fair" on installation because of weight, added support required and poor wall anchors. If we have any issues leaking in the future, I'll come back and add info.